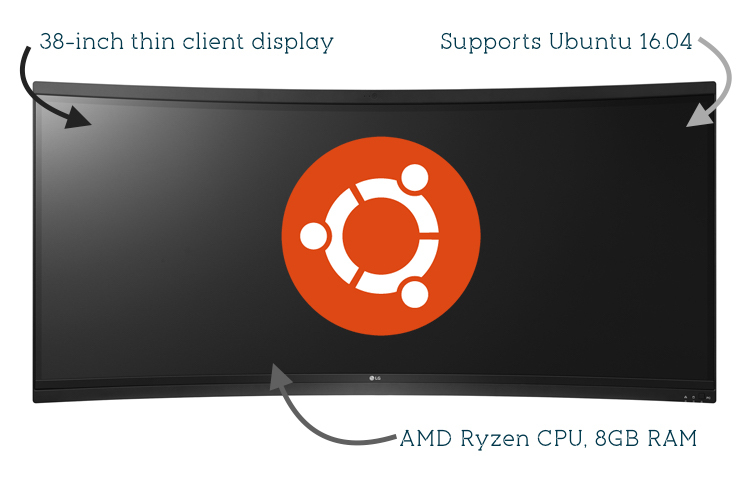 LG has launched a new 38-inch curved monitor with a basic PC built-in supports Ubuntu. Although LG pitches the device as a mere monitor it is technically an all-in-one PC. The awkwardly named ‘LG 38CK900G-B’ comes powered by a fanless dual-core AMD Ryzen chip with Vega graphics, and comes backed by 8GB DDR4 RAM. LG has launched a new 38-inch curved monitor with a basic PC built-in — and, rather awesomely, it supports Ubuntu. A spacious internal 128GB SSD is blank by default, but LG lists Ubuntu 16.04 LTS as an officially supported operating system (alongside something called Windows 10, which I’ve never heard of). The 37.5-inch UltraWide IPS display has as a 21:9 aspect ratio, a 3840 x 1600 resolution, 5ms response time, and generous viewing angles. Wireless and bluetooth come built-in, as does a (fairly decent) webcam and 10w stereo speakers. The 19.5lbs monitor has a VESA mount on the rear but doesn’t come with a stand (which, considering the size and weight, would need to be one heck of a stand). The mighty monitor also has HDMI input, 2 regular USB 3 ports, 2 USB Type-C ports. a mic port, and ethernet. This thin client display is, for all its novelty, aimed at business users whom, one imagines, will find use for it as some sort of kiosk PC or digital signage. The LG 38CK900G-B is not intending to adorn the walls of regular Joes like you and I. Which is just as well considering that I find my existing 21.5-inch 4K monitor big enough for my needs! If you own a business, a public space, or a trendy start-up where this monitor would have a use you can find out more on the LG website. Pricing is only revealed on an inquiry basis (which basically means it’s super expensive) and no hardware configuration options are available.